Every responsible car owner should own a socket set in this day and age, even a small one should do the trick. Seeing how accessible and affordable these sets have become, it would be a real shame not to see such a kit for what it is – an investment in your own future. Given how many detachable parts a car has, you are bound to make good use of such a set sooner or later, even if only to save you an hour or two when the inevitable happens and you have to get your hands dirty. With that in mind, let us point out that socket sets can differ quite a bit from one another depending on the size, comprising pieces, and manufacturer. It is for that reason that you need to take inventory of what the market has in store before making a purchase. To give you some pointers, we put together a list of the ten best socket sets money can buy. 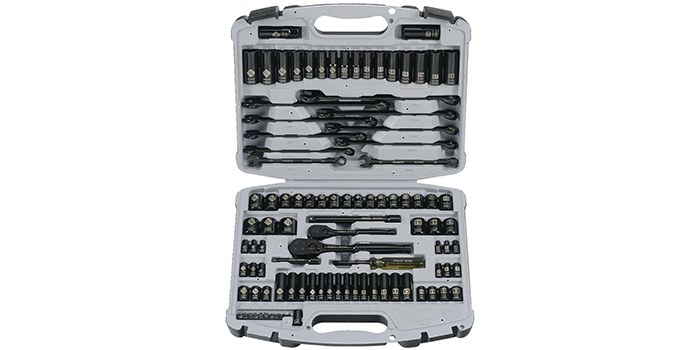 Providing a complete set of tools, the Performance Tool 40-Piece Socket Set comes with a ratchet, extension bar, sockets an adapter and other necessary tools. Available in sizes varying from 5/32th-inch to 3/4th-inch and 4 mm to 17 mm, these tools are designed to perform effectively and are durable. With just a 5-degree swinging arc to wrench, it comes with uniquely designed teeth that do not require any additional effort. Made with premium grade vanadium steel with a chrome plated finish, these tools come in a protective, well-molded black box that is a great storage space for the tools and also makes it easy to carry. Thanks to its 12-point socket construction, the TEKTON 3/8-Inch Drive Deep Impact Socket Set comes with heavy duty sockets that easily grip the flat side of fasteners, while eliminating rounding off. Crafted with a longer, deeper broach, it accommodates longer fasteners. Featuring laser etched size markings on each socket, it is easy to read and select the right one, even in dark areas. Made with chrome vanadium steel that is heat treated, with a black phosphate finish that is resistant to corrosion, this socket set meets and exceeds all performance standards of the ANSI. 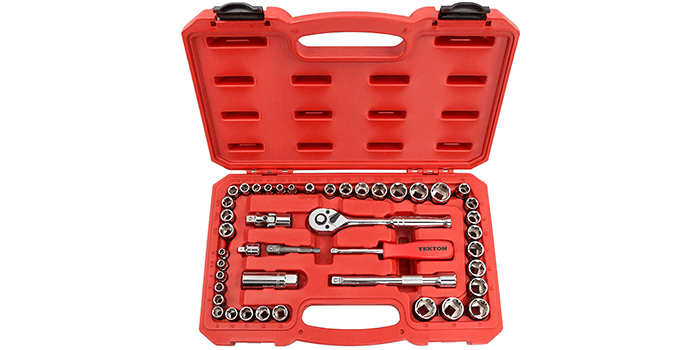 The TEKTON Drive Socket Set is a complete kit including all- sizes of sockets measuring from 3/16th-inch to 3/4th-inch and from 5 mm to 9 mm. Unlike other tool sets of its kind, this one comes with additional items including a power socket adapter, an extra-long extension cable, a universal joint, and a screwdriver adapter. With a 72 tooth ratchet that is finely geared, it only requires a swing arc of 5 degrees. The sockets in this kit come designed with a 6-point grip that fits the flat sides of fasteners and not the corners. Made from premium grade chrome vanadium steel with a chrome plated mirror finish, these tools are durable, convenient to use and come in a handy box, making it easy to carry. 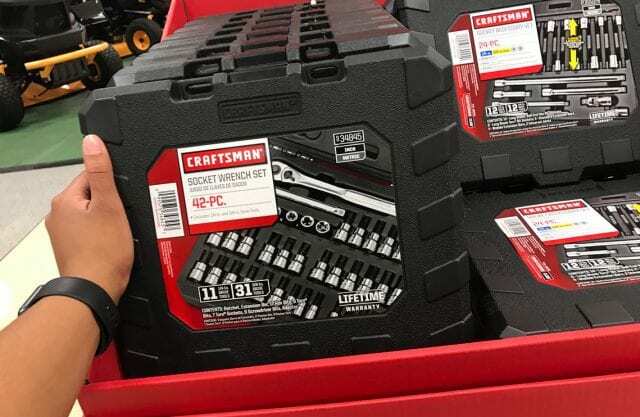 Including a total of 92 sockets in three variable sizes, the Craftsman 165-Piece Mechanics Tool Set comes equipped with a single ratchet in each drive size with 2 universal joints and 2 extension bars. 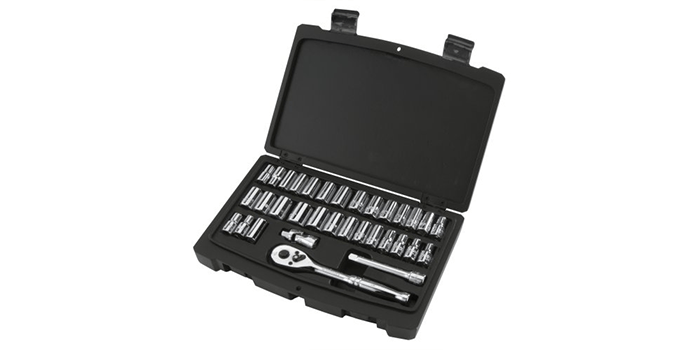 Along with this, it features 12 wrenches both in inches and metric sizes as well as screwdriver and nut driver bits, hex keys and a driver handle, all made from heavy-duty, durable materials. The set comes with a handy carry-case/storage box that holds all the above tools in one place, making it easy to carry around. 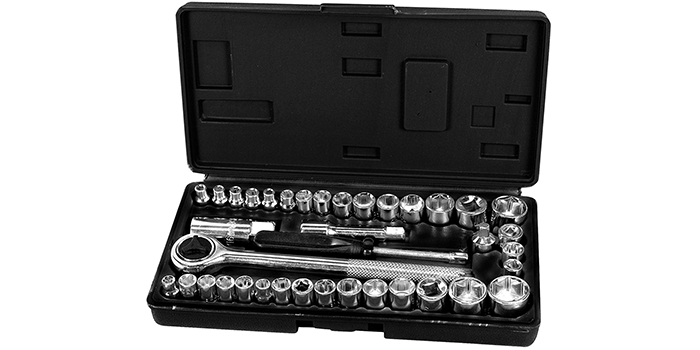 The Stanley 30-Piece Socket Set is a heavy-duty set of tools that include MicroTough Ratchets and Laser Etched Sockets. Thanks to the unique design and construction of the MicroTough Ratchets, it features the smallest ratchet head that fits easily in tight areas. Equipped with a durable, sturdy bi-material handle that is made from rubber, it offers a better, much more comfortable hold and grip. Featuring a quick release button, it enables easy changing of sockets and saves time. Designed and crafted with an easy to carry box, this premium grade socket set meets the American National Standards Institute (ANSI) standards for sockets, wrenches, and tools of this kind. 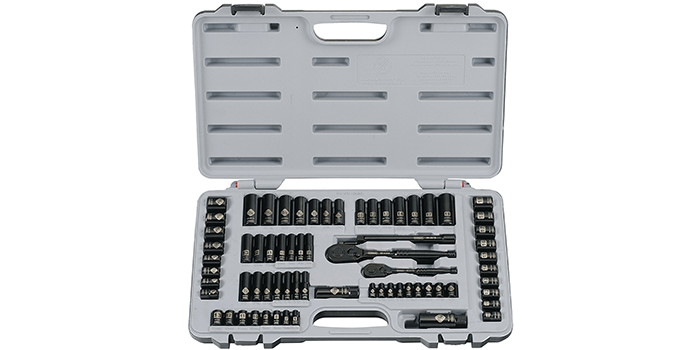 Made with premium quality, heat-treated vanadium steel alloy with a chrome plated finish, the EPAuto 40-Piece Drive Socket Set is a durable toolkit that is resistant to corrosion and is mirror-polished. 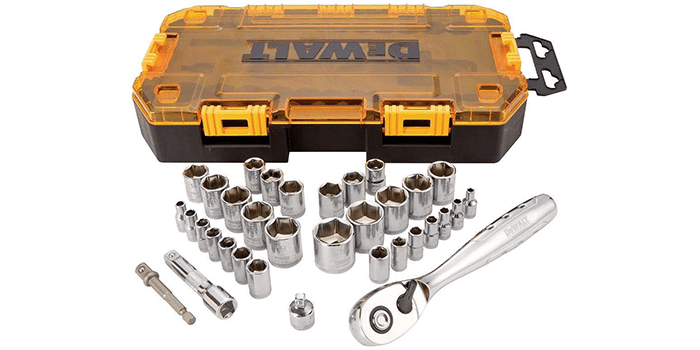 Featuring metric and English sizes that include 1/4th and 3/8th-inch drive sockets, this kit comes with a heavy-duty 3/8th ratchet that is reversible, a spin disk, an extension bar, 2 adapters, 1 spinner handle and more. For easy transporting, these tools come in a molded carry case that is convenient and makes a great storage unit for the tools. Featuring the latest DirectTorque technology, the DEWALT Drive Socket Set includes 34 heavy duty tools that are sized at 1/4th and 3/8th inch. Constructed and designed with premium grade vanadium steel with a polished chrome finish, it comes with a knurled control ring that is durable offers added control while dealing with sockets. Including a 72 tooth ratchet that gives a 5-degree arc swing, it offers optimum maneuverability in tight areas. Thanks to its hard stamped markings on each socket, it makes it easy for the user to identify the size he requires. 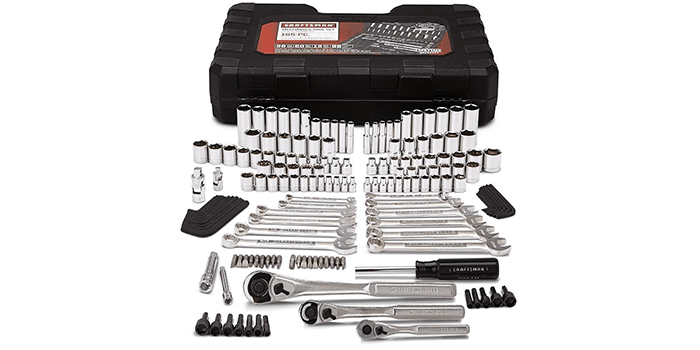 The Stanley Black Chrome and Laser Etched Socket Set is a 99 piece toolkit that features a max-drive design and construction that delivers 15% more torque than other kits of its kind. Thanks to its black chrome finish, not only does it give each tool a sharper outlook but it also helps protect the tool from corrosion and is resistant to slipping. Thanks to its handy carry case that comes with the set, it makes a great storage and travel box that is extremely convenient to carry. The Stanley Black Chrome and Laser Etched Socket Set is a 69 piece tool kit that meets all standards of the ANSI for sockets and ratchets. Made with heavy duty vanadium steel, it features a black chrome finish that is resistant to corrosion improves the durability of the product. Compared to other socket sets of its kind, this one offers 15% more torque, thanks to its high-end max-drive design. 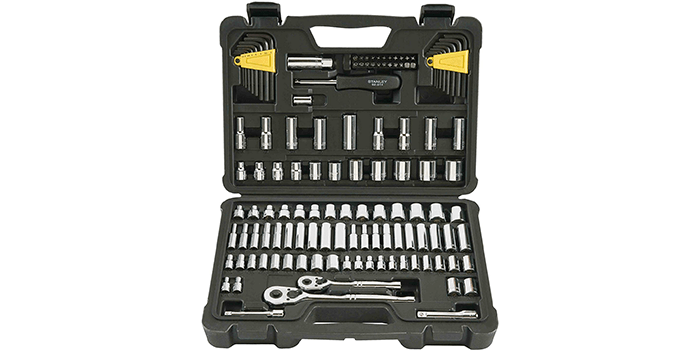 Including a handy case that allows easy storage and makes it easy to carry while traveling, this socket set comes with a lifetime warranty. 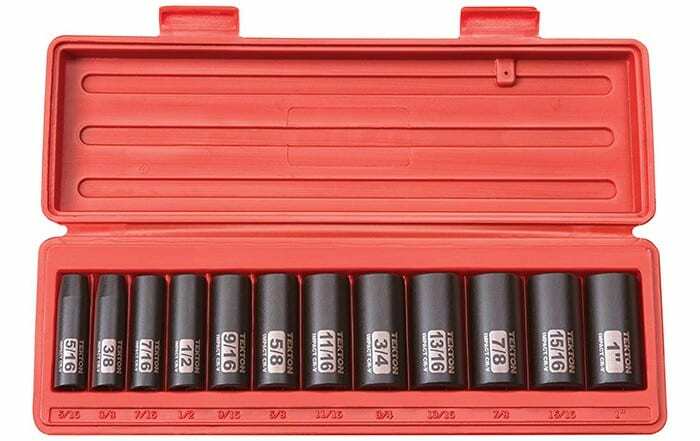 Known for its premium quality, the Stanley 123-Piece Socket Set stands out as being a complete tool kit, one that was designed for easy operation and excellent results. Crafted with a chrome finish, vanadium body that offers decent torque and strength, it comes equipped with a handy release switch that allows easy changing of sockets, along with a reversible function for quicker operation. Furthermore, thanks to its full polished chrome body, it protects the tools from corrosion and rust. 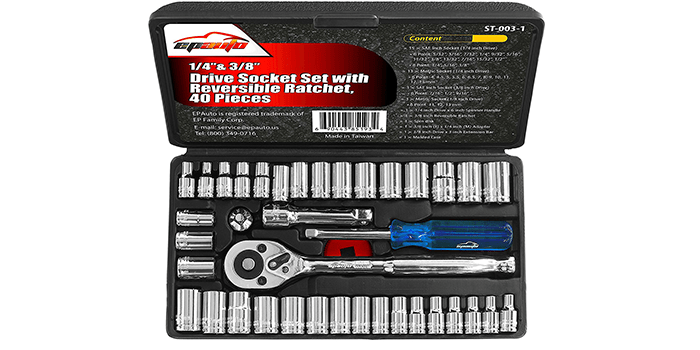 Overall, it is perhaps one of the best socket sets out there.